In home massage and mobile spa service Miami -Dade, Broward and Palm Beach. Ritual…. Experience the lure of these exotic South Florida treatments which are enticing sensations for pampering the mind, skin, face and body. To begin, our luxurious in home body scrubs are rich in minerals and trace elements that not only leave your skin breathtakingly soft and silky but refreshed and ready for regeneration. Each wondrous body scrub exerts a cleansing effect on the skin, with a combination of herbs, essential geranium oils and pure honey, a combination that will foster healthy skin and leave you purified. Also covering Kendall, Boca, Delray and Boynton, the unique and legendary minerals of our aromatic mud body wrap has been known to produce relaxing, meditative and purifying benefits. It will expel the impurities and toxins of the body, leaving it nourished, revived, tighten and toned. These Exotic, unique and the ultimate sublime treatments have been passed down through generations and we are happy to introduce your body, skin and spirit to an amazing escape that you will approvingly savor and cherish. Ever dream of being pampered thoroughly. This Japanese sea salt full body scrub combines the riches of an exfoliator and aromatic scent of the ocean all in one. As a popular ultra relaxing therapy experience cultivated from ancient eastern practices, it provides a treatment which sends signals that respond through the nerves to balance and calm the bodies correlating systems, not only physiologically detoxifying, but re-mineralizes as it nourishes dry depleted skin. Before your body can accept moisture, dead skin cells must be removed, the focus of this treatment will first be exfoliation, then we will completely hydrate and nourish the body with earthly minerals, trace elements and french botanical that will take you into pure bliss and while reconnecting you with your emotional and spiritual entities. As bentonite from ancient sea beds is lathered upon your hips back and buttocks we will provide a pleasing eastern reflexology massage and then place the aromatic scrub upon your feet. 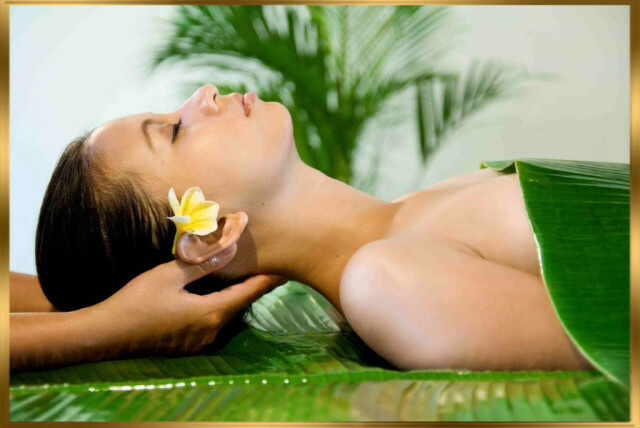 We believe every customer of Eminence should be treated like royalty, and we are here to spoil you with delights. Never has a body scrub been so luxuriously refine. Treat yourself to a defiantly wonderful experience in your home, office or anywhere your imagination takes you…you deserve it! Created from fibrous stalks and manuka honey to first remove dead cells and other impurities that dull the natural glow of your skin, it effectively helps to restore your body’s natural texture and tone, this scrub reduces cellulite, seals in moisture, and leaves your skin defined and toned with the combination of all the qualities to delight the skins senses and please the mind. Energize the body, boost immunity, protect yourself against sun rays, and enjoy a refreshing feel as your skin is magically transformed into the finest of pure silk. You will receive the ultimate pampering treatment with your skin care professional. Welcome to a world of relaxation and enticement by immersing yourself in the serenity of our Dead Sea Mud Treatment. Our tantalizing aromatic moor mud treatment is used to open pores , draw impurities, detoxify and tone the skin, enhance smooth ens, texture, and deeply purifying the body and spirit. This treatment is well known for its healing properties and very high concentration of minerals, the Dead Sea has mud has even offered users relief from aching joints, stiffness, weight loss, skin problems and other toxic ailments. Our talented therapist will luminously spread dead sea aromatic mud onto your stomach, back, buttocks and hips while wrapped in warm sheets or blankets, they will massage your scalp and neck finishing with an enticing shoulder massage. We guarantee results that leave your body exceptionally soft, relaxed, smooth and glowing. You will be begging your therapist to schedule YOU another one! Prepare your body! While wrapped in this reparative cocoon, your skin will deeply absorb rich nutrients and minerals that are found in herbal mist and Imperial Matcha green tea. As a warm mask delivers essential minerals that are moisturizing yet detoxifying. Our ginseng and organic extracts will eliminate impurities and produce nutrients within the skin that will slim, tone and improve your over all texture. We recommended this treatment for all skin types, it is an invigorating body wrap that is rewarded for its renowned exfoliating power using organic and natural products. Once our herbal products are place upon your skin our therapist then massage your scalp and neck using acupressure techniques to relax and untighten any stiffness in these areas. The treatment will then begin to restore your skins vitality through deep cleansing and nourishment while replenishing your skin’s long-term health and welcoming immediate results which cleanse your body and health systems. A treatment that is as invigorating as it is purifying.